Good gosh! We’re less than two weeks out from MadCamp, which is what they are now calling BarCampMadison. It’s set for Saturday, August 27th, 2011. 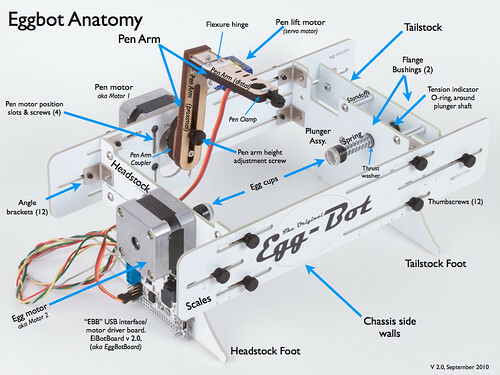 So here’s the thing, I’m planning on doing a session titled “An Introduction to the Egg-Bot” in which I’ll show up with an Egg-Bot, my MacBook, and a whole bunch of eggs, and walk through plotting on eggs with a CNC drawing robot. Here’s where you come in… You may have seen some of the things I’ve plotted before, and I’m trying desperately to create some new designs before MadCamp, but I will welcome anyone who wants to try their hand at it to bring an SVG, and we can try to plot it. OK, that one bit, “Read this entire tutorial” may not be 100% necessary, but you need to at least skim it to understand how things work. You can’t have any filled areas, as everything is done with strokes. You can do more than one color, but you need to separate them by layers. Extremely complex designs can take 10+ minutes, and the session will only last about an hour. 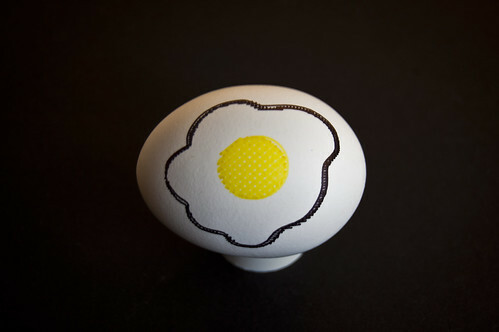 Anyway, feel free to bring your logo in the right format, or some other piece of art you’d like to see on an egg. Or, you could send me the file ahead of time and I’ll try to prep it and give it a quick look over. Maybe you’ll get an Egg Egg of your own! Posted on Wednesday, August 17th, 2011 at 6:00 am. Subscribe to the comments feed. Both comments and pings are currently closed. Post on your own blog.